Now there is an up-to-date guide for optimizing pharmacologic therapy in treating patients with heart failure. Reflecting current practice at leading medical centers, Heart Failure: Pharmacologic Management provides both the biologic and pathologic underpinnings of each pharmacologic agent in current use. It also supplies detailed discussions of the clinical investigations that support current understanding of the risks and benefits associated with the use of these drugs. Thorough references make the book useful to the novice as well as the experienced clinician. An extremely helpful concluding chapter provides a roadmap of drugs with which to approach the patient with heart failure, along with an overview of the skills you need to use it most effectively. This straightforward, step-by-step algorithm will save you countless hours of research and help you make your prescribing decisions with confidence. 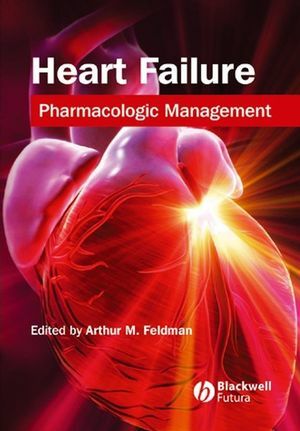 Arthur M. Feldman is the editor of Heart Failure: Pharmacologic Management, published by Wiley. 1. Diuretics in congestive heart failure (Alicia Ross, Ray E. Hershberger and David H. Ellison). 2. Use of digoxin in the treatment of heart failure (Deborah DeEugenio and Paul J. Mather). 3. Renin-angiotensin system and angiotensin converting enzyme inhibitors in chronic heart failure (Rimvida Obeleniene and Marrick Kukin). 4. Angiotensin receptor blockers in the treatment of hart failure (Anita Deswal and Douglas L. Mann). 5. Beta blockers (Peter F. Robinson and Michael R. Bristow). 6. Aldosterone antagonism in the pharmacological management of chronic heart failure (Biykem Bozkurt). 7. Inotropic therapy in clinical practice (Sharon Rubin and Theresa Pondok). 8. Antiarrhythmic therapy in heart failure (Igino Contrafatto and Leslie A. Saxon). 9. Treating the hypercoagulable state of heart failure: modifying the risk of arterial and venous thromboembolism (Geno J. Meril and Hoard H. Weitz). 10. Vasodilator and nitrates (Abdul Al-Hesayen and John D. Parker). 11. Natriuretic peptides fro the treatment of heart failure (Jonathan D. Sackner-Bernstein, Hal Skopicki and Keith D. Aaronson). 12. Immune modulatory therapies in heart failure: using myocarditis to gain mechanistic insights (Grace Chan, Koichi Fuse, Mei Sun, Bill Ayach and Peter P. Liu). 13. The role of vasopressin and vasopressin antagonists in heart failure (Olaf Hedrich, Maervin A. Konstam and James Eric Udelson). 14. Role of erythropoietin in the correction of anemia in patients with heart failure (Revecca P. Streeter and Donna M. Mancini). 15. Endothelin antagonism cardiovascular disease (Srinivas Murali). 16. Pharmacogenetics (Richard Sheppard and Dennis M. McNamara). 17. Management of diastolic dysfunction (Arthur M. Feldman and Bonita Fakner). 18. Multidrug pharmacy for treatment of heart failure: an algorithm for the clinician (Mariell Jessup).